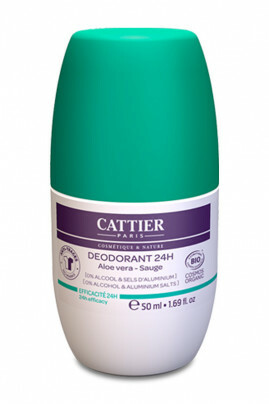 Cattier Roll-On 24-hour Effective Roll-On Deodorant has been specially designed to provide softness, comfort and freshness throughout the day. Formulated without alcohol and without aluminium salts, it protects and respects the sensitive skin of the armpits even recently waxed. Dermosoft®, a natural, antibacterial and purifying active ingredient, prevents the formation of odours without blocking the natural perspiration process. It leaves no white or yellow stains on clothing. Its light fragrance with notes of cherry blossoms leaves a discreet and perfumed veil on the skin. Aqua, triethyl citrate, propanediol, glycerin, silica, parfum, cetearyl wheat straw glucosides, cetearyl alcohol, sodium caproyl/lauroyl lactylate, hydroxystearic/linolenic/oleic polyglycerides, sodium stearoyl glutamate, aloe barbadensis leaf extract*, xanthan gum, sodium benzoate, bisabolol, salvia officinalis oil, tocopherol, geraniol, linalool. 99.6% of the total ingredients are of natural origin.